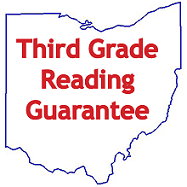 Ohio's Third Grade Reading Guarantee is a program to identify students from kindergarten through grade three that are behind in reading. Recent legislation strengthened the guarantee to give a greater emphasis to reading instruction and intervention in the early grades. Through this initiative, school districts and community schools will diagnose reading deficiencies in students at grades kindergarten through three. Below are links to documents further explaining the updated Third Grade Guarantee policy guideline for district s.